The first weekend of October is not messing around, starting with two releases that have both Best Picture potential, as well as blockbuster potential of varying degrees. The drudgery of September gives way to tremendous quality in all respects, right off the bat. 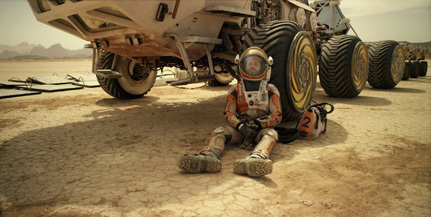 The Martian is the big ticket item here, starring as it does one Matt Damon in a science-fiction action-thriller, directed by Ridley Scott and based off last summer's page turner of the same name. Add in an all-star supporting cast, and this killer premise is set to explode the fall season. About that premise – it's several decades into the future and on one of the manned Mars missions – and they've become kind of blasé by this point – an astronaut is left stranded and thought dead on the surface thanks to a sudden storm and an emergency evacuation. But – surprise! - he's only badly injured and managed to crawl back into the crippled habitat for the mission, with little food and barely any water or air. Plus, you know, it's four years for a rescue mission, so... good luck surviving? As high-concept premises go, that's a doozy, and is effectively Apollo 13 meets Cast Away, with a dash of Gravity, which shows you why many people have it on their must-see list for the season. Damon seems like perfect casting for the jovial, sarcastic character of Mark Watney, with the end of the trailer getting one of those long list of vertically stacked names such as *deep breath* Jessica Chastain, Rooney Mara, Kristin Wiig, Jeff Daniels, Sean Bean, Kate Mara, Chiwetel Ejiofor, Donald Glover and Michael Pena. It's a great combination of premise and cast, a paean to engineering, ingenuity and just plain hard-headedness, all glitzed up with Hollywood dazzle and FX. The tone the film strikes, a step-by-step survival guide leavened with a razor-sharp dry wit, is one of the easiest slam-dunk adaptation properties in some time. Of course, Ridley Scott is not immune to screwing up a golden premise (*cough*Prometheus*coughcough*), but trailers, commercials and promo clips indicating that they've hit that tone exactly, with the Rise of the Nerds becoming complete in the movie. The question becomes how high this film can reach at the box office. Two years ago this weekend, Gravity opened to $55 million on the strengths of a spectacular trailer and a sequence they were confident enough to release in total, showcasing the FX. It's not quite the same strategy here, but there's also a bit of proof of concept, in that audiences know what heights this kind of film can reach. The recent announcement of the discovery of flowing water on Mars certainly can't hurt. I'm prepared to lift the ceiling from that number to a dazzling $72 million opening weekend.